*Who can be a Myster Shopper? This e-book is a more than adequate introduction to mystery shopping. It describes what mystery shopping is, what qualities are needed in a mystery shopper, what to be wary of if you're applying to be a mystery shopper, and the duties you will undertake. It's nothing new or groundbreaking, but it does have all the information you're going to need if you're thinking about getting involved in mystery shopping. It's also a decent guide for people who are already working as mystery shoppers and just need a little help in organizing their workload as well as their mystery shopping activities. 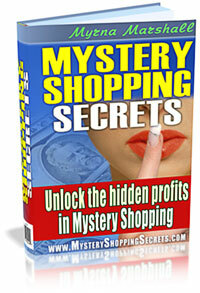 The e-book also provides lists of equipment and resources for those of us who want to work as a mystery shopper. Save for the typos (my personal pet peeve), I highly recommend this e-book. Good for those who are merely curious, those who are really interested, and those already in this line of work. A friend of mine had introduced me to “mystery shopping” before. It was a job that I wanted, and I was curious about it, but writing had a more persuasive pull. This e-book by Myrna Marshall answered my questions. This e-book walks you through all aspects of mystery shopping and is probably the authority on this business. So much has been said about article writing and all other methods of earning online, but so little has been said of mystery shopping. While this is not as comprehensive as I would really want, this still is excellent as a resource for mystery shopping. As a plus, the layout is clean, and it is well-organized. The cover page really compels you to read the e-book, because it’s very attractive. The topics covered include the ways to tell whether the program you’re joining is a scam, and there is also a primer on the payment facilities you need to sign up for to be paid for doing mystery shopping jobs. While this may not be the most comprehensive resource around, this is a basic, for-dummies how-to on mystery shopping, and it’s bound to start you on your way in that business.